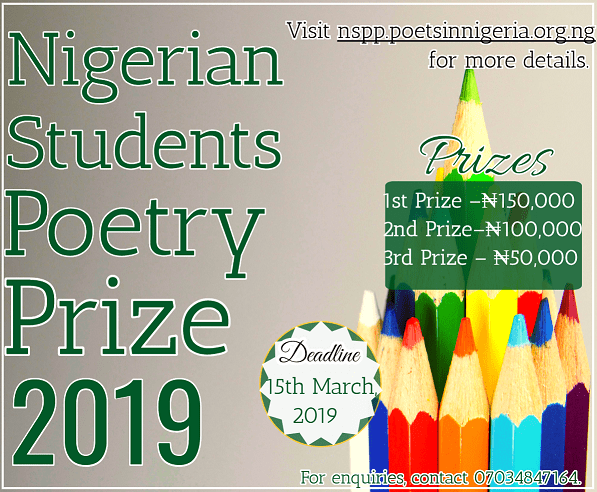 Reputed to be the foremost poetry prize for Nigerian students, the NSPP has been hosted by institutions such as University of Nigeria, Nsukka (2017) and Godfrey Okoye University, Enugu (2018). As host of the fourth edition of the prize, Niger Delta University, Wilberforce Island, Yenagoa, will be the venue for the NSPP awards ceremony slated for mid-2019. Previous grand prize winners of the prize include Noah Oladele (Obafemi Awolowo University, Ile-Ife; 2016), Bakre Fadil Adedamola (University of Ibadan; 2017) and Godstime Tamunofiri Iberiyenari (Niger Delta University, Wilberforce Island, Yenagoa; 2018). Denja Abdullahi (President, Association of Nigerian Authors), Prof. Akachi Ezeigbo (Joint Winner of The Nigeria Prize for Literature; 2007) and Ismail Bala (literary critic and lecturer, Bayero University, Kano) chaired the judging panel for the 2016, 2017 and 2018 editions of the prize respectively. The fourth edition of the Nigerian Students Poetry Prize (NSPP) opens to submission between 15th January and 15th March, 2019. Interested Nigerian undergraduates are expected to submit a 30-line poem on any theme of their choice before the deadline. Submissions are to be made at https://nspp.poetsinnigeria.org.ng, with strict adherence to the instructions thereon. Poems must be original intellectual property of the entrants. Under no condition will the judges’ unanimous decisions be challenged. Entrants should subscribe to poetsinnigeria.org.ng for regular updates. For enquiries, contact the moderator – Phone: +2347034847164; Email: poetsinnigeria@gmail.com. Great work by PIN connecting the poets. Good evening, please Iwant to apply for this, but confused on how to go about it. Follow the instructions on this page —> http://nspp.poetsinnigeria.org.ng. Good afternoon. I made my entry few days back, but I mistakenly submitted it without fully editing the piece, and it was only my first name that was sent. Please I need help, else the poem wouldn’t even be understood. Thank you . Please I need help, I made my entry few days back but I mistakenly submitted without fully editing the piece. And if not opportuned to do that, I don’t think it will be understood.l also mistakenly send only my first name. I tried going back to edit but couldn’t. Thank you. The site is functional now. Hello, how much do any of the anthologies expected to be purchased cost and how is the payment to be made? Visit https://nspp.poetsinnigeria.org.ng for more details.